My last blog post looked at the various building names, businesses and artworks that have been inspired by Sheffield’s industrial heritage. 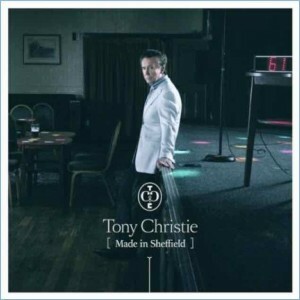 In this post, I want to consider one specific aspect of this referencing of history, namely the use of the term ‘Made in Sheffield’. 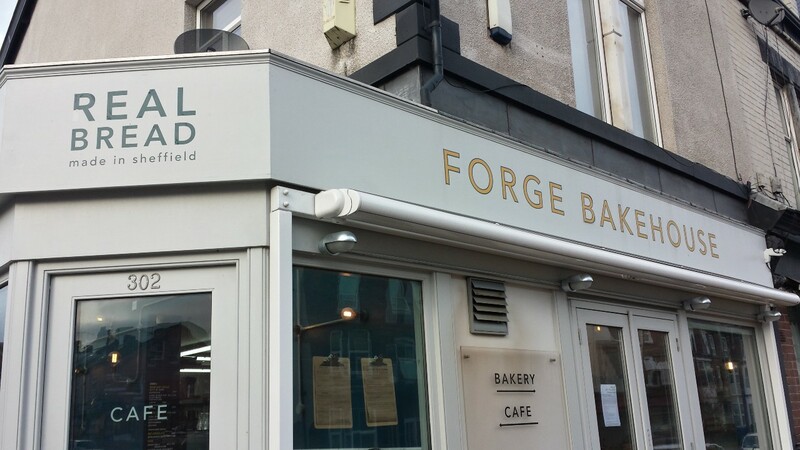 I touched on this theme last week, when I discussed this image (below) of Forge Bakehouse, which combines the idea of being ‘Made in Sheffield’ with a reference to traditional metalwork (a forge) and the notion of authenticity (real bread). 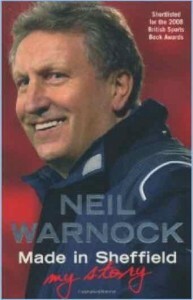 ‘Made in Sheffield’ in this context is therefore a concept linked to quality, based on a location-specific pedigree. Such referencing of Sheffield will be relevant to my study of a local dairy, as the location of their production (and the importance of this) is part of the narrative their share online, through images. 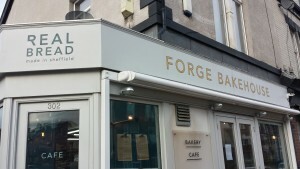 So what prompted this bakery to make such a statement about itself? 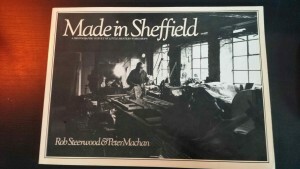 I will begin by looking at the ‘Made in Sheffield’ trademark, which is used under license. 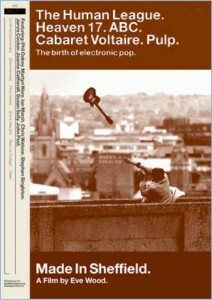 The licensing company’s website emphasises a connection between a long industrial heritage and contemporary manufacturers from a range of sectors. 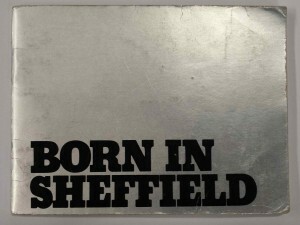 As the screenshots from the website below demonstrate, steel manufacture still looms large in the way that Sheffield views itself, and is presented to others. 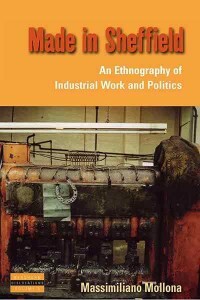 ‘Made in Sheffield’, unsurprisingly, features heavily in books about local industry, ranging from Steerwood and Machan’s nostalgic images of little mesters, to Mollona’s ethnography of small-scale contemporary metal production. So how does this heritage play out in spaces unconnected with heavy industry? 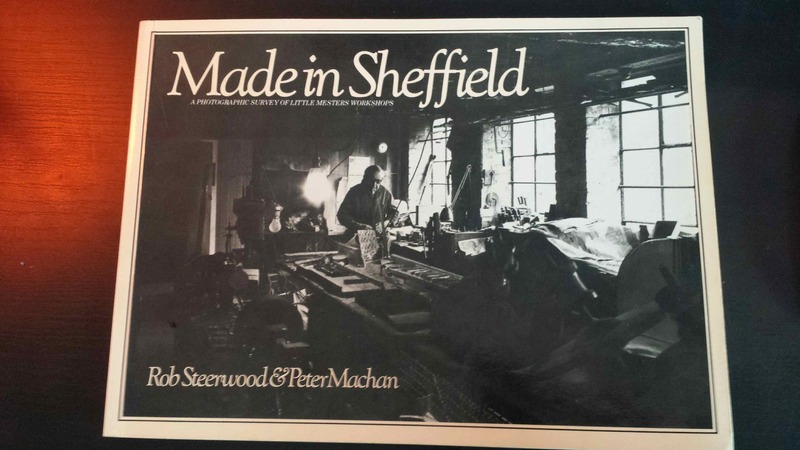 How is ‘Made in Sheffield’ relevant as a concept, beyond a demarcation of manufacturer location? 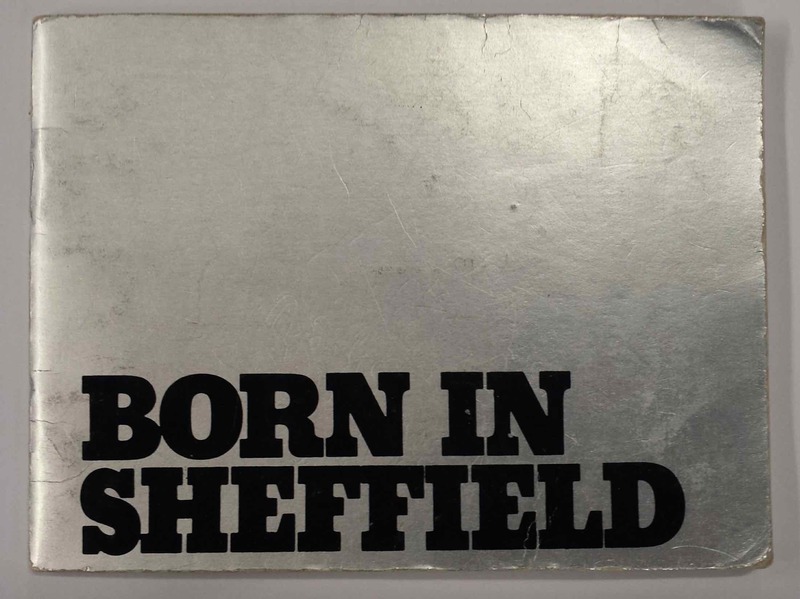 An interesting example of the wider deployment of the concept of ‘Made in Sheffield’ is the Sheffield Birth Book, which was given to new parents of children born in Sheffield for recording the child’s weight, height etc. 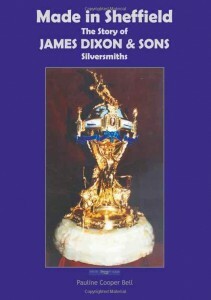 Therefore the location-specific associations of Sheffield are being extended to its citizens, as well as to the goods that are produced here. 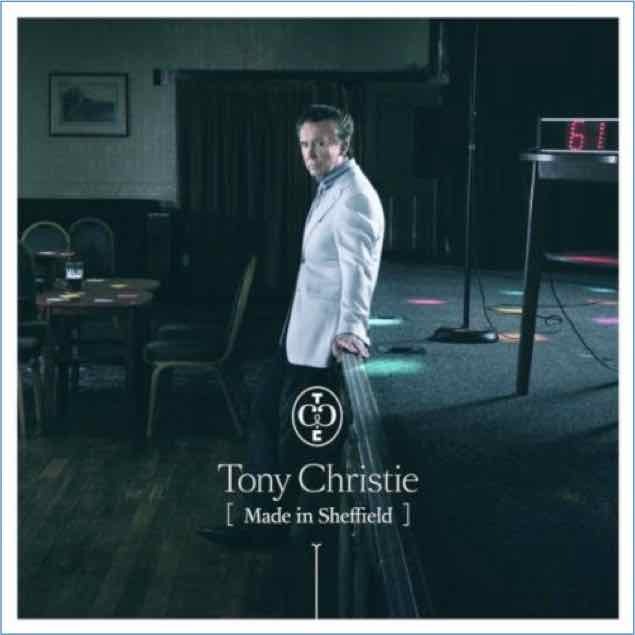 ‘Made in Sheffield’ is not just a demarcation used in industry, but is also a tool for people to think about themselves: as being from somewhere, and imbued with certain qualities as a result. Some examples from popular culture below – a film, an album, and a sporting memoir – demonstrate different ways in which the concept of being ‘Made in Sheffield’ is deployed in reference to group and individual identities. 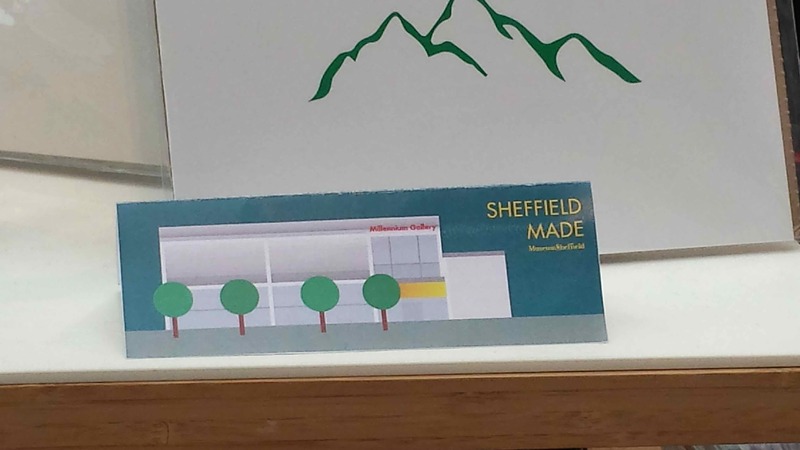 Being ‘Made in Sheffield’ is a concept deployed by various companies to convey different values. Local radio and TV station Sheffield Live states that it is ‘Made in Sheffield. Made by You’, making a connection between location and a focus on the community. In a different vein, clothing manufacturer Buffalo states that its products are ‘still made in Sheffield’, implying that continuity in one place is a positive quality associated with craftsmanship and tradition. 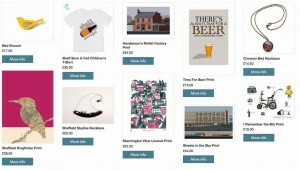 A screenshot from the Museums Sheffield online shop, below, demonstrates how Sheffield, as a general theme, features heavily in the items for sale, in the form of jewellery, prints and clothing. But what makes the ‘Sheffield Made’ label and mug interesting is that they are constructing a perceived market for these goods, by presenting ‘Sheffield Made’ as a quality that we should be interested in and attracted by. This market is construed as valuing items that are made locally, which connote both supporting small manufacturers, and obtaining goods that are only available here, and are therefore desirable by virtue of their comparative rarity. 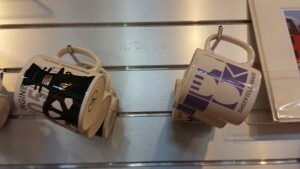 But this market is also assumed to value Sheffield-based production to the extent of wanting to celebrate it in its own right (by virtue of a statement on a mug, which ironically was probably not made locally). 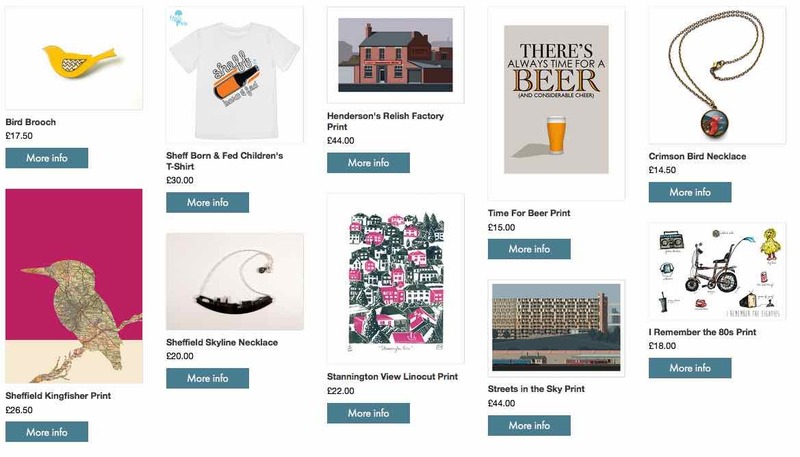 Being ‘Made in Sheffield’ is therefore not just a quality that is used to make items more appealing: it is also the concept itself that is being sold. 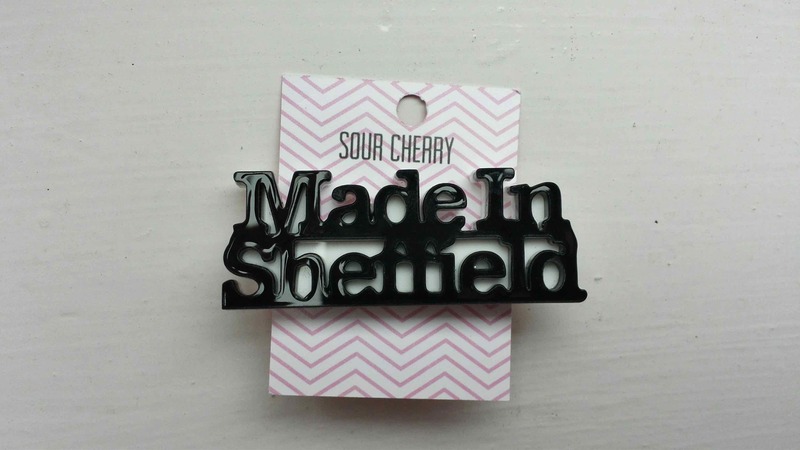 We see an explicit example of this in the jewellery made by Sour Cherry, which produces (in Sheffield) ‘Made in Sheffield’ badges and necklaces. 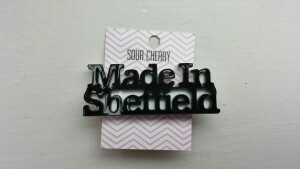 Here, the ‘Made in Sheffield’ tag is being extended from the product to the purchaser, in that they themselves will wear a statement of origin. 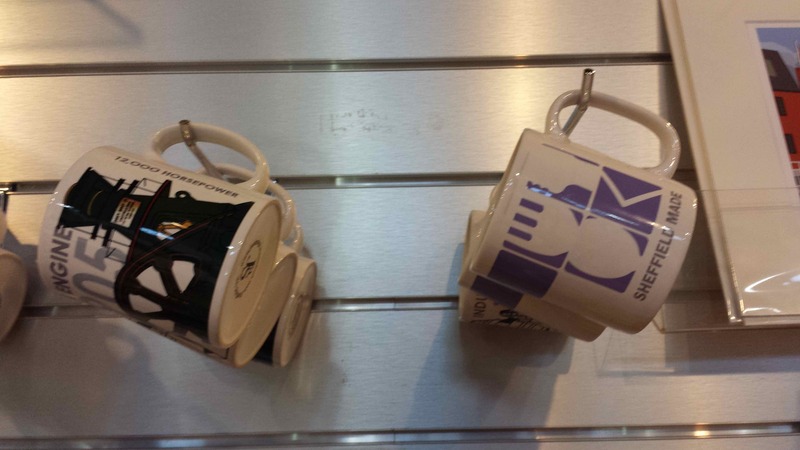 The design itself, as with the label and the mug above, responds to and produces an intended market, who is assumed to have certain ideas of what being ‘Made in Sheffield’ ‘means’ to them and to others. This series of examples has helped me work though some ideas about what ‘Made in Sheffield’ means, and the different ways in which it is used. Taking photographs for this, as with the previous blog post, enabled me to not only explore a concept but to present my argument, through showing evidence of how one phrase is deployed in different ways. Additionally, the ability to photograph examples as I found them meant that I could keep a record of the numerous instances of ‘Made in Sheffield’ that I encountered. 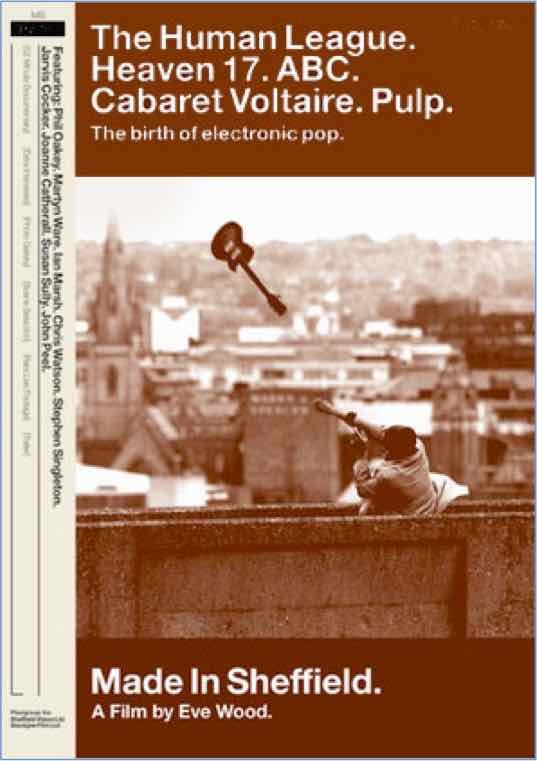 Therefore although this post is not about photography – and therefore might seem to have strayed from my original topic – it demonstrates how images are useful for expressing one’s viewpoint, here in relation to the reframing of location based identities. 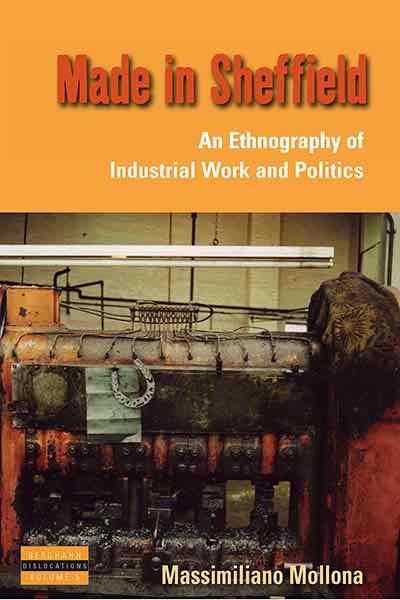 So photographs in this instance form both a kind of background reading, and a contribution to my argument, as they help me to explore the broader concept of ‘Made in Sheffield’, and to consider how this applies to my own case study.